Summer promo fare deals are not yet over!!! You can still avail of low fares via the latest Cebu Pacific seat sale 2017! 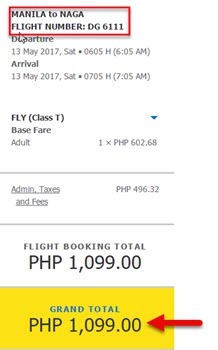 Good for trips for the months of April, May, June 2017, the cheap tickets can be booked until March 9 or until sale seats are available. For as low as P1,099, fly from Manila to Naga or Tablas. Tickets from Manila to Bacolod, Cebu, Tacloban and other local destinations can be availed at P1,499. If you are heading to some of the famous summer destinations like Boracay (via Caticlan), Coron, Davao, Dumaguete, promo flights are as low as P1,799. Tickets are ALL IN: base fare, Web Admin Fee, taxes and fees are included in the sale ticket. Thinking of having a vacation abroad? Flights to Taipei from Manila or Cebu cost only P1,799. Visit other Asian cities like Bangkok, Busan, Guangzhou and other cities for as low as P2,799. Booking for the promo is until March 9, however, do not take chances. Cebu Pacific sale tickets are limited, so book your tickets fast! Below is a sample ticket booking for Manila to Naga P1,099 sale flight. The Cebu Pacific promo tickets are good for one-way trip to your desired destination. Domestic airport fee from Manila/ Caticlan/Cebu and International terminal fees for flights exiting Manila are included in the promo ticket. 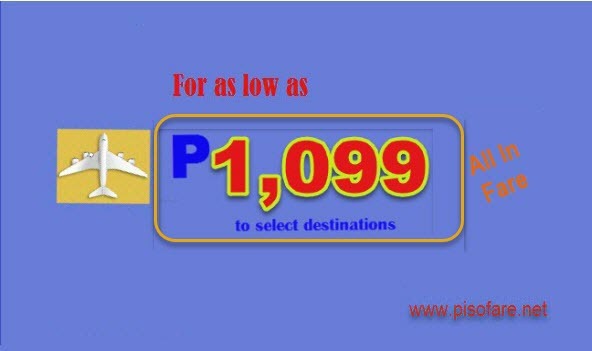 The low fares of Cebu Pacific are available via online booking at www.cebupacificair.com, thru mobile app booking or buying the sale tickets at Cebu Pacific ticketing offices, booking outlets and travel agencies. Here is a List of Cebu Pacific Ticketing Offices in Luzon in case you want to buy your tickets. Don’t take too long to decide when you want to get the Cebu Pacific sale seats! Book or buy your tickets ASAP! For more promo fares 2017 and PISO FARES 2017 to 2018, visit and follow our Facebook page: PISO FARE TICKET!! !